REUTERS – The quake shook buildings in the capital city of Santiago, about 280 km (175 miles) to the south. President Michelle Bachelet said she planned to travel to the areas worst affected by the quake, the biggest to hit the world’s top copper producer since 2010. “Once again we’re having to deal with another harsh blow from nature,” Bachelet said in a televised statement. Television images showed panicked people gathered in streets lined with damaged buildings, while big waves flooded roads in some cities along the coast. Operations were suspended at two major copper mines operated by Codelco [CODEL.UL] and Antofagasta PLC (ANTO.L) that generate annual capacity of more than 600,000 tonnes. Copper prices on the London Metal Exchange CMCU3 rose to two-month highs in early Asian trading as worries about supply disruptions offset lingering concerns about demand from China amid copper’s longest rout in years. The quake also damaged homes, buildings and injured several people and was felt as far away as Buenos Aires in Argentina. Frequent aftershocks continued to shake the country. Tsunami advisories were issued for parts of South America, Hawaii, California and French Polynesia, although waves are generally expected to be small. As far away as New Zealand, authorities urged residents in eastern coastal areas to stay out of the water and off beaches amid expected “unusually strong currents and unpredictable water flows near the shore”. “It’s going to be a long night,” said Ronny Perez in the inland Chilean city of Illapel, about 46 km (28 miles) from the epicenter, which was without electricity or drinking water. A 26-year-old woman was killed by a collapsing wall in Illapel and another person died from a heart attack in Santiago, according to media reports. 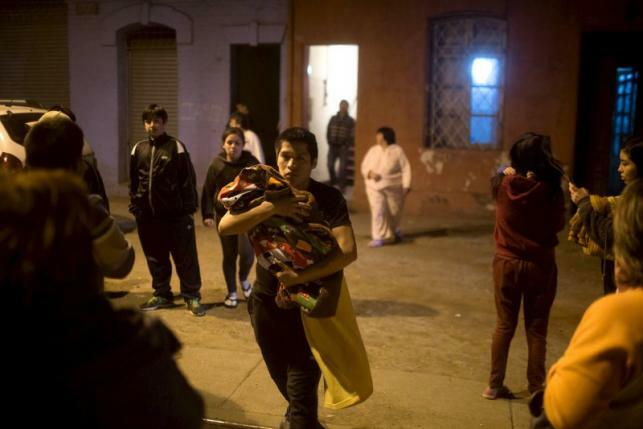 The coastal town of Coquimbo was hit by waves of up to 4.5 meters (15 feet) after the earthquake, Chile’s navy said. “We’re going through a really grave situation with the tsunami. We have residential neighborhoods that have flooded …. The ocean has reached the (Coquimbo) downtown area,” said Coquimbo Mayor Cristian Galleguillos. Chile is due to celebrate its national holiday on Friday, a time when families traditionally get together. Many schools are closed for vacation, and many Chileans have already left for the holidays, while others may find themselves stranded, with media reporting that roads had been cut off and public transport canceled between Santiago and the north. Less than an hour after the initial earthquake, three aftershocks all greater than magnitude 6.1 struck the region, and smaller quakes continue to shake the area, The U.S. Geological Survey (USGS) reported. State copper miner Codelco said it had suspended mining operations at its Andina mine and had evacuated workers from its Ventanas smelter. Antofagasta said it had halted operations at its flagship Los Pelambres copper mine and would wait until daybreak to assess damage. Chile, which runs along a highly seismic and volcanic zone where tectonic plates meet, is no stranger to earthquakes. In 2014, an 8.2-magnitude quake struck near the northern city of Iquique, and four years earlier an 8.8-magnitude earthquake in central-southern Chile triggered a massive tsunami, and more than 500 people were killed. In the hours following that quake, President Bachelet and other government officials misjudged the extent of damage and declined offers of international aid. That delayed the flow of assistance to disaster areas, leaving many survivors feeling they had been abandoned by the government. Compounding matters, the Chilean navy’s catastrophe-alert system failed to warn the population of impending tsunamis, leaving hundreds who survived the initial quake to be engulfed by massive waves that followed. Bachelet´s government was also slow to prevent looting following the quake.